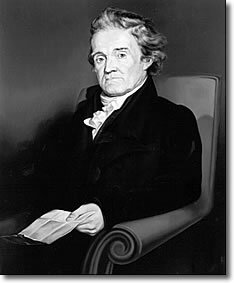 America's first lexicographer, Noah Webster (1758-1843) was born in a farmhouse on the outskirts of Hartford, in what is now West Hartford CT.
Noah Webster lived near Hartford with his strict Calvinist parents and four siblings, helping to work the land until he was 16 years of age. He left home to attend Yale College on the eve of the American Revolution, and was caught up in the intellectual ferment of the time. He served with the American forces in the war and later returned to Hartford to practice law. Webster saw it as his purpose in life to give Americans a new "national language" to go along with their new order of government and society. By 1828, working alone with pen and paper, he had completed a 70,000-word dictionary, which included 12,000 words never previously included in a dictionary. The dictionary sold over 300,000 copies in some years. Along with his Elementary Spelling Book and grammar, the dictionary standardized Americans' distinctive spelling, pronunciation, and usage. His spelling book alone sold more than one million copies annually after 1850, and that was in a nation of only 23 million people! After Webster, Americans no longer had to use schoolbooks and dictionaries written and published in England. Thus, we are indebted to him for such simplified spellings as "honor" instead of the English "honour," and "neighborhood" instead of "neighbourhood." You can visit Webster's boyhood home in West Hartford CT: the Noah Webster House and Museum.